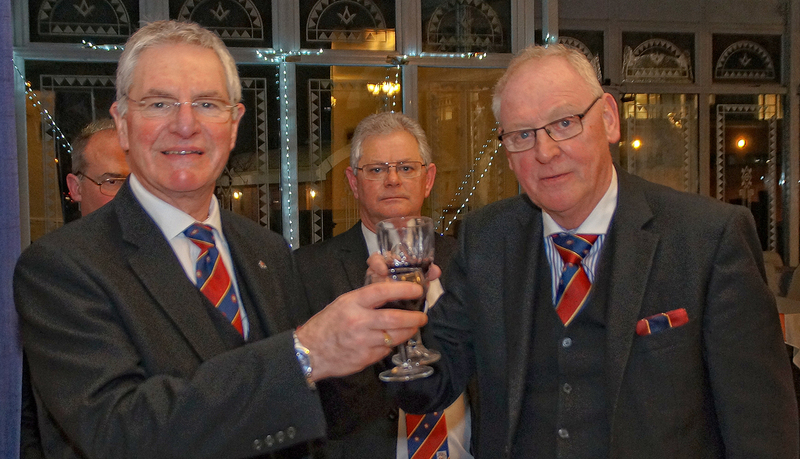 Ashton District Lodge of Installed Masters No 8341 marks the turning of another year. The Ashton District Lodge of Installed Masters No 8341 marked the turn of the year, at Ashton Masonic Hall, in the usual ceremonial of placing a new Master in the Chair. This year we put WBro Peter Douthwaite, PProvJGW into the Chair in an excellent ceremony, performed by Southern Area’s APGP WBro Gerald Hodson, and which was overseen by our own APGM, John Pearson, our Past APGM Bill Waite, two other Grand Officers and a good forty members and guests. When you think that only about four years ago ADLIM was on the verge of closure with just a handful of members, then this really is a success story of which we can all be proud. John Pearson set about bringing ADLIM back from the point of no return, almost single handedly at first. However, he very quickly found a large measure of support for the project from the members of local Lodges. Now our numbers are swelling, we have a steady stream of joining members, and things are going well. The idea has always been to make this one of the pre-eminent Lodges in Southern Area and slowly but surely that process is coming to fruition. Peter Douthwaite is the third Master to come from the newly joined members of this growing Lodge, he was preceded in 2018 by Gerald Hodson and in 2017 by Ken Hampson. Peter was installed by Gerry in a wonderful, precisely correct ceremony, handled beautifully by the Lodge Officers. used for any commercial purpose without the express written permission of the copyright holder.